Never use any copper, brass, bronze, lead or zinc tubing for your lobster tank as the metals are poisonous to lobsters. Use stainless steel or PVC pipe instead. Watch for foam on the surface of the water, which is an indication of a wounded or dying lobster. Choosing a lobster from a tank when you go to a restaurant or a grocery store is a way to guarantee you are getting the freshest, most succulent lobster meat available. The only way to improve it would be to pull one straight from the ocean. You can get that fresh lobster taste at home by raising lobsters in your own tank. Lobsters are very low maintenance animals (you usually don't even need to feed them) and you can set up a lobster tank similar to the way you would set up a fish aquarium. Choose the right size tank for your lobsters. Set up a large enough tank that allows for twice as many gallons of water for the weight of your lobsters. For example, if you are going to put five 1-pound lobsters in the tank, it should be large enough to hold 10 gallons of water (more if you expect the lobsters to grow). Attach a refrigeration unit or chiller to the tank to keep the water extremely cold, which will keep your lobsters healthy and pose less threat of cannibalism. Keep the water between 40 and 45 degrees Fahrenheit. Choose the right equipment to maintain your lobster tank. Install a gravity percolation filter system (to de-gas and oxygenate the water), biological filters (to remove waste materials) and a submersible pump (to move the water through the filtration system). Maintain the water composition. Use a commercial marine life salt mix to keep the salinity of the water around 30 to 35 parts per million. Condition any municipal water added to the tank in order to remove chlorine and other minerals that are commonly found in household or ground water. Use natural seawater, if possible. Maintain a pH level of between 6.5 and 8.5 through water changes and chemical adjustment. Inspect the lobsters for health reasons. 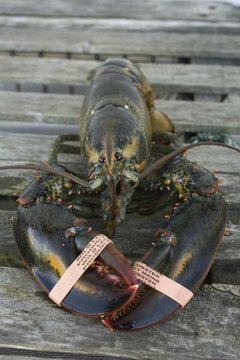 Do not add lobsters with missing appendages or cracked shells or membranes, as they will likely get eaten by the other lobsters. Band all of the lobster claws with rubber bands. Keep "shedder" lobsters (ones who have recently molted their shell) separated from the other lobsters until the shell has had a chance to harden (usually a few days). Keep the tank clean by performing a 10- to 15-percent water change weekly. Always condition the water prior to adding to the tank. Check the filters two or three times per week and rinse when needed. Replace if the filters have become worn or damaged. Use a testing kit to check the water composition at least once per week. Do not feed the lobsters as a general rule; as long as the water is kept at the right temperature, mature lobsters can survive several months without food. Feed the lobsters a pellet feed obtained from your pet store if raising chickens (young lobsters). Use a settling tank (one that allows for uneaten food and waste to settle on the bottom of the tank) if you need to feed the lobsters. Remove the lobsters from the tank for consumption once they have reached the desired size or appear to no longer be growing.